If you’re looking for solitude on the stream, the challenge of sport fishing, opportunities for family fishing or just fishing fun, you’ll find it here. Anglers can expect an incredible Keweenaw Peninsula Fishing experience. The following species can be found in each of these lakes and streams. Copper Harbor on Lake Superior is a designated splake fishery. The DNR has been planting splake there since 1972. The local splake committee is dedicated to supporting and improving the harbor for splake and other large fish. At the mouth of the harbor, you’ll find steelhead running in spring and salmon in fall. Walleye, pike and lake trout can be found in the spring with sporadic visits throughout summer. Take your boat and venture out a mere 800 yards into Lake Superior and find lake trout, coho salmon and other big lake fish all summer long. Besides great fishing, the beauty of the harbor is jaw dropping. Lake Manganese anglers will find perch, smallmouth bass and the occasional brook trout. This is a small, pristine, lake maintained by the DNR. You won’t find homes and buildings here, just a nice sand beach and wildlife. Lake Fanny Hooe offers perch, crappie, walleye, smallmouth, largemouth and rock bass along with brook trout, splake and sunfish. This pretty lake is long and has a few deep spots. It was named for a girl that went missing in the 1840’s while living at Fort Wilkins, which is now a State Park located along the north shore. Nearby Lac La Belle has a great assortment of fish species including pike, perch, crappie, walleye, smallmouth bass, rock bass, smelt and the occasional musky. Lac La Belle means Beautiful Lake and it lives up to its name. 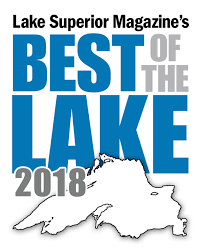 It is connected to Lake Superior which allows a great variety of species throughout the year from your boat or charter. Boat and motor rentals are available in the area. The Copper Harbor public marina has excellent overnight docking facilities if you pull into town.